Kota Kinabalu, a coastal metropolis christened after the mythical mountain in Malaysian Borneo, plays host to the first ever Super Series Finals on December 18. For the eight players or pairs invited to participate in each of the 5 disciplines, it’s an all-expenses-paid trip plus a swipe at what will be the biggest prize money in badminton — a claim up till now held by the Korean Open. Nice gig if you can get it. Before the final list of participants is announced on December 8, for some, it will feel like a tight qualifying race all over again. The last time players focused this intently was in pursuing their Olympic dream. Those holding onto the no. 8 qualifying spots in the first cut ought to feel threatened. Only just hanging on are several Olympic Gold medallists including the man everyone turns up to watch, Athens winner Taufik Hidayat, and the latest in a production line of Korean mixed doubles champions Lee Yong Dae/Lee Hyo Jung, who scooped gold in Beijing. With the China Open and Hong Kong Open unfolding back to back, there are still sufficient Super Series points up for grabs such that players lagging up to 10 places behind in the standings could possibly make up ground. Keep your eyes peeled on Badzine’s SS Finals Dummy List. With less than 3 weeks to spare, the relentless momentum of any of the following promising players qualifying will certainly make the Finals roster all the more appealing. The gap seems wider than it actually is but we can discount retired players and discontinued old pairings. Startling discrepancies are offered up between BWF World Rankings and the Super Series Standings. There’s a player who set out only to prove something to herself and ends up commanding the enviable position of being world #1 in women’s singles, #1 in Super Series Standings (SSS), and having earned her newfound reputation entirely on individual tournament points alone – Zhou Mi. 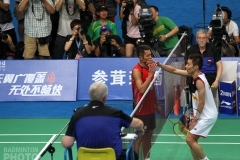 On the other hand, the current world #2 in men’s singles, who set out to underline in bold his relevance in the annals of badminton and to the world at large by conquering the singles Olympic gold medal in spectacular straight sets fashion on home soil, now finds himself sitting at #16 on the Super Series standings. Lin Dan (pictured) needs to lift the next 2 Super Series trophies to have any chance of heading to Kota Kinabalu. Few would put this feat beyond him. Lin not only has to reach the top 8 in the standings but additionally displace either Chen Jin or Bao Chunlai as the rule is a maximum of 2 players from any member nation. 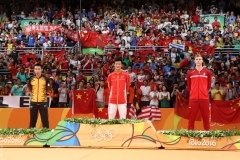 Bao’s withdrawal from the China Open leaves the door ajar for Lin Dan to make headway. 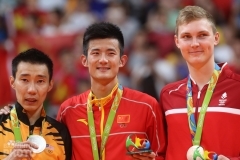 One might also ponder whether Chen Jin would gift Lin Dan a victory to return the favour for his eleventh hour Olympic qualification should they meet in the next fortnight of rounds. The pressure of being world #1 and having never won a major title in this position may be weighing on Lee Chong Wei, or are the Malaysian press making too much of it? In Lee’s favour are memories of amazingly winning the 2006 Malaysia Open (incidentally, that was in Kuching, also in Malaysian Borneo), from a 7-point deficit and staring at match point in the rubber game against none other than Lin Dan. Which two out of four will China dispatch for women’s singles? Lu Lan and Zhu Lin are the frontrunners but the former has not defeated top seed Zhou Mi (pictured)of Hong Kong in six attempts (5 of them this year). 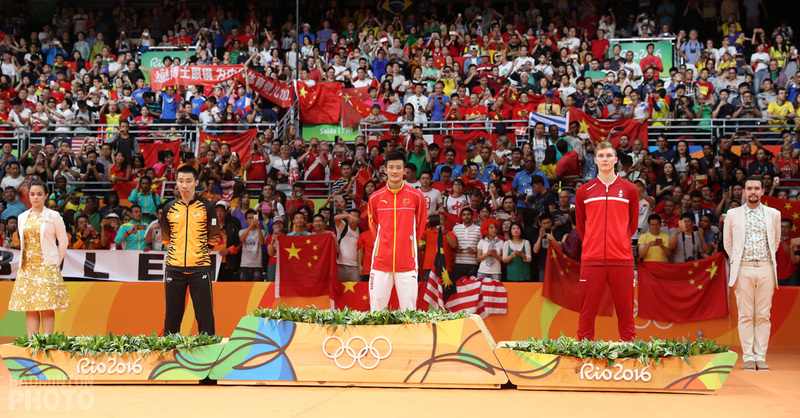 On the other hand, China could well be heading into a new era with a different family name forming a dynasty in singles as youngsters Wang Lin and Wang Yihan follow on from the two Gongs and the three Chens earlier in the decade. China could take a calculated risk with either Wang, as each has a victory against Zhou and recent Super Series titles of her own as a direct result. China will probably make up their mind closer to the day. They usually send one player representing experience and the other representing youth. Depending on how you look at it, China has the luxury or headache of several choices here. 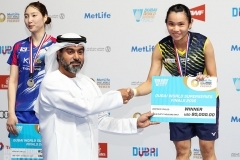 In women’s doubles, it will be a personal best for Malaysia’s Chin Ee Hui/Wong Pei Tty to justify their #1 standing especially against the convincing Olympic Gold medallists Du Jing/Yu Yang. New kids on the block Zhao Yunlei/Cheng Shu will most likely be the second Chinese pair to qualify. It is nice to Japan on the rise. Under Park Joo Bong’s tutelage, both men’s doubles pairs Masuda/Ohtsuka (pictured) and Ikeda/Sakamoto stand to be rewarded for their consistently solid performances by making the cut for the first dummy list. This could be their farewell tournament and the ideal way to end their careers on a high note. As mentioned in passing earlier, China and Indonesia will strive to add second pairs to the Kota Kinabalu roster. How unusual to have 1 representative in contention from either country. The Super Series Masters Finals was to debut last year but could not be organized in time. As a brand new major tournament it is, therefore, in search of an identity and purpose. Falling at the close of an Olympic year, it does not have to search too hard because ideally this will usher in a new regime for us to watch for several years to come. 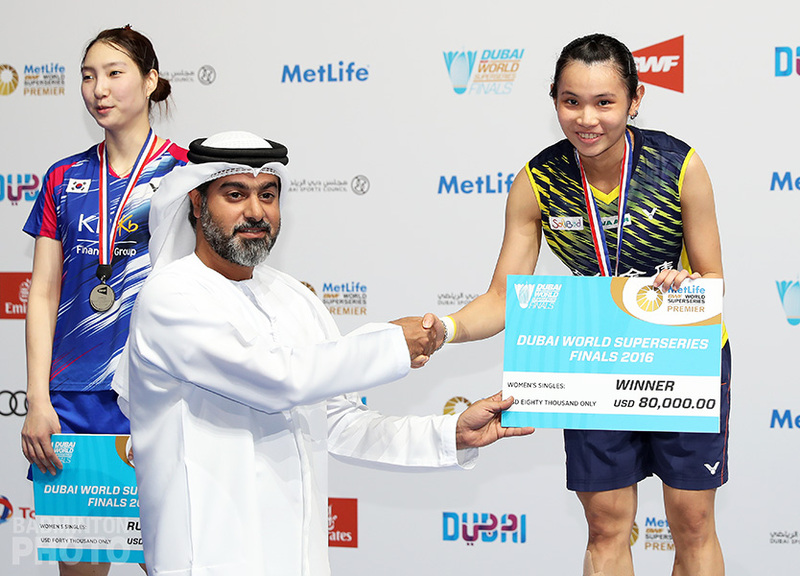 A good mixture would be the best of the best (Du/Yu, Lin Dan) thrown in with the new pretenders to the throne (Tago, Nehwal), plus a few all time favourites (Hidayat, Gade). Maybe a wild card process could make it happen as early as this year. It hasn’t been ruled out yet. If nothing else, there’s money to be made, which is saying a lot in badminton.